Rev. Jen Nagel will be received to the Evangelical Lutheran Church in America clergy roster on Sunday, September 26. The Rite of Reception will occur during a 10:30 a.m. worship at Salem English Lutheran Church, where Pastor Jen has served since 2003. 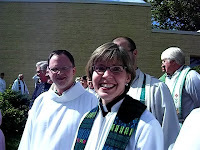 Pastor Jen was ordained at Salem English Lutheran in January of 2008. Salem English Lutheran is located at 2822 Lyndale Ave S. in Minneapolis. This will be the third ELCA Rite of Reception for extraordinarily ordained pastors. Salem English is a transformational and urban ministry in the Uptown neighborhood of Minneapolis. Pastor Jen is trained in intentional interim ministry. She holds an M.Div. from University of Chicago-Divinity School, completed work at Lutheran School of Theology in Chicago and at Concordia College in Moorhead Minnesota. She has served at Central Lutheran Church and Hennepin County Medical Center in Minneapolis, as well as in Africa, Chicago, Michigan, and outdoor ministry settings. Jen has served as a member of the Central Committee of the World Council of Churches and the Minneapolis Area Synod Council. She is currently serving as Co-Chair of the Extraordinary Lutheran Ministries Covenant Circle. Earlier this year, Minnesota Public Radio interviewed Pastor Jen about the changes in the ELCA ministry policies. You can watch the interview here. Pastor Jen and her partner, Rev. Jane McBride, live in Minneapolis with their daughter.